Bengal cats trace their ancestry to a mix of wild and domestic felines. You're in love with your Bengal cat's vivid markings, beautiful eyes and lovable personality -- and you want to show him off in the ring. Although standards for this 30-year-old breed are still evolving, most associations that accept Bengals in shows categorize them by pattern and color. Bengals fuse the exotic looks of Asian leopard cats with the affectionate, companionable nature of domestic kitties. The wild Asian species has markings similar to those of jaguars, leopards and ocelots, but these cats -- about the same size as the average pet kitty -- are extremely shy. As a result, breeders have focused on both appearance and temperament, and today’s Bengals are known for their friendly, outgoing personalities. They tend to be active, intrepid and curious. Unlike many cats, Bengals also like water -- yours might even hop into the shower with you. 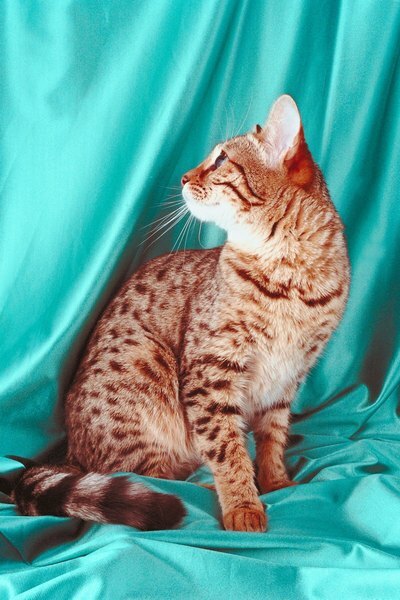 To be eligible for showing, your Bengal’s coat must be either spotted or marbled. Judges prefer patterns that contrast dramatically with the base or ground color of the cat’s coat. Regardless of the pattern, show cats should have distinct chin and eye markings, and white or cream chests and bellies. If you have a spotted cat, visit the show or an association's website to find out whether your cat’s markings qualify him to compete. Spots vary in shape, size, configuration and even number of colors, and each association has detailed standards. The marbled pattern features long, curving lines and swirls. Although the tabby gene contributes to this look, a cat who sports the straight lines typical of domestic breeds could be disqualified or penalized. Bengal coats come in a variety of tones and colors, but for show purposes, they’re divided broadly into brown and silver. Different associations might not accept all the same colors, so before you enter your cat in a competition, visit the show or association website for standards. Brown variations can include brown tabby, lynx, mink, seal lynx point, seal mink tabby and seal sepia tabby. Coats that combine shades of brown and white include seal silver lynx point, seal silver mink tabby and seal silver sepia tabby. The silver tabby or black silver tabby features a light ground color with dramatic black patterns. You can enter Bengal cats in shows by The International Cat Association, the American Cat Fanciers Association and the American Association of Cat Enthusiasts. However, the Cat Fanciers’ Association Inc., which operates a pedigreed cat-breed registry and sponsors shows, doesn’t recognize Bengal cats because of a policy against breeds with wild ancestors. What Is a Cat Fancier Show? What Is the Most Prestigious Dog Show in the World?